Lyme Disease Information | Florida Farm & Feed, Inc.
Lyme disease – also called Lyme borreliosis – can be frightening, but when you learn the facts about this condition, you can better avoid any contagion and react appropriately if you do get infected. The most common symptom is a unique type of rash – a circular patch that gradually expands and creates a bulls-eye pattern. The red parts of the skin may be warm, but are rarely itchy. Not everyone will show every symptom if they are infected with Lyme disease, and some people show no significant symptoms at all. Because most of these symptoms are rather vague and can apply to many different conditions, a blood test will often be necessary to properly diagnose Lyme disease. If you have been in a tick-infested area prior to developing these symptoms, or if you know you've had a tick bite recently, it is best to consult a physician as soon as any symptoms appear. For most people, a simple course of antibiotics is sufficient to combat Lyme disease and they will recover completely. Treatment is faster and easier the sooner the disease is diagnosed, so speed is essential for an easier recovery. There are times, however, when the symptoms may become chronic and longer treatment is necessary. If symptoms persist for months, it is best to speak with a physician to discuss other possible causes or adjust treatment. Getting plenty of rest, following a healthy diet and exercising regularly are all great steps to help speed a recovery as well. Avoid tick-infested areas, including scrub brush and long grasses where deer may graze regularly. Moist areas are especially prone to tick infestations and should be avoided. Cover exposed skin so ticks cannot bite. Long pants tucked into socks or high boots will help minimize any tick bites. Wearing light-colored clothes can help you spot ticks quickly. Use strong insecticides with a 20-30 percent DEET composition to keep ticks away. Not only should exposed skin be sprayed, but spraying clothing is also useful to discourage ticks. Keep your lawn neatly trimmed and surrounding bushes pruned to minimize tick habitat. Choose deer-resistant plants to avoid bringing tick populations into the yard from infected deer. Check your pets regularly to be sure they are not harboring ticks, and use suitable tick-repellant collars, drops or other treatments to protect your pets. After being in an area where ticks may be present, inspect yourself and your clothing for any bites or embedded ticks. Shower right away to remove sweat that can attract ticks. At the same time, run your clothing through the dryer to remove moisture ticks love. If you find a tick in your skin, remove it carefully with tweezers using a firm, steady pull. 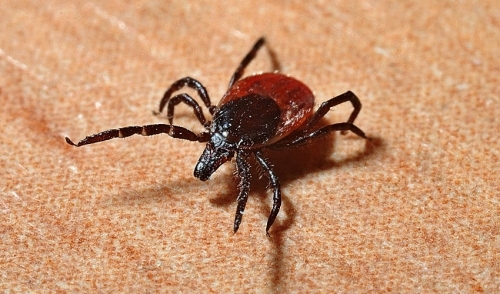 Wash the area thoroughly with soap and water or an iodine solution, and stay alert for any Lyme disease symptoms for at least 1-2 weeks after the bite. Lyme disease may seem scary, but once you know the truth, you can take easy steps to protect yourself and be sure you don't have any problems with this widespread condition.